Tempering Pattern: Suguha, weak or missing in areas. Dimensions: Blade Length: 26.75", Nakago: 7.5", Mihaba: 1 1/16", Sakihaba: 3/4", Kasane: 1/4", Sori: 7/8"
Mountings: Black lacquer saya with a leather wrapped tsuka and an iron tsuba which I believe is cast. The habaki is two piece copper with gold wash on one part. 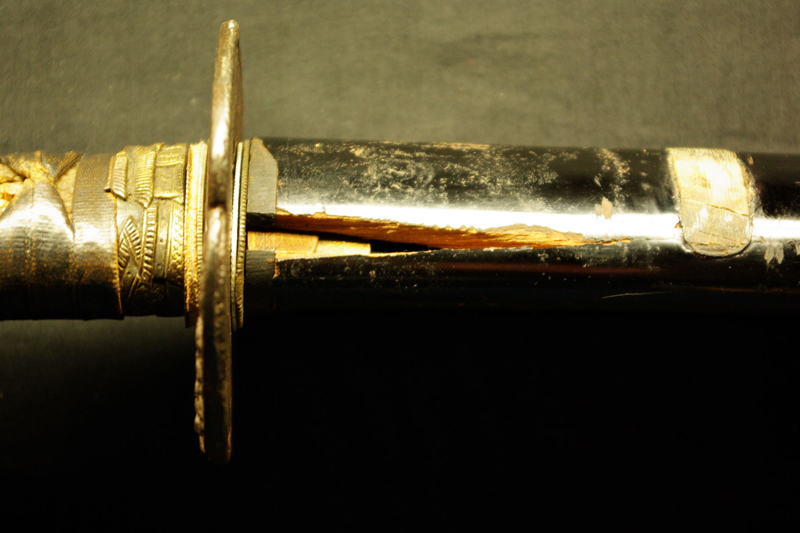 Overall Condition: The blade has a number of forging cracks or openings and one very small blister that I found. See the pictures for the larger openings. The smaller openings will most likely disappear when the blade is polished. The larger openings could disappear also with a polish but that can not be guaranteed. The saya is in poor condition with cracked seems and a large piece at the coiguchi missing (see picture). The tsuka is solid with leather ito in good condition and copper fan menuki but the kashira is missing. 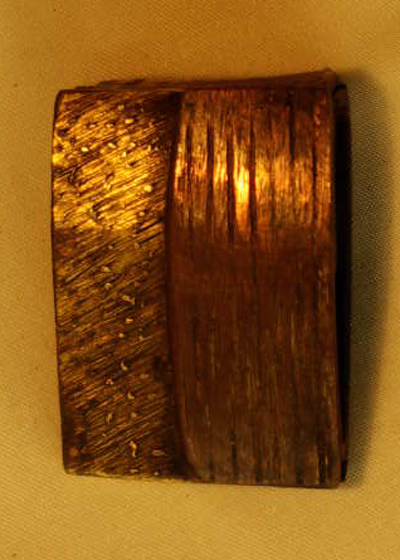 The fuchi is in worn but solid condition and appears to be shakudo with gold highlights.